One of the best decisions I ever made as an artist after I got out of art school was to return to drawing the figure from life in regular sessions. Few practices are as challenging or rewarding for an artist as drawing the human form. The great traditions of Western art are founded on it and it is still one of the most fundamental aspects of artistic endeavor. If you’re not a full time art student, finding a session for drawing from life is somewhat easier in large or medium size cities than in more rural areas, but it can be a bit of a challenge even there unless you know where to look. Often there are classes or workshops offered by art schools, museums and artists’ organizations, but you have to search them out. Figure Drawing Open Studios, Workshops, and Continuing Education Classes is a list assembled as part of the web site supporting The Art Model’s Handbook, a book aimed at those who work as artist’s models (a more demanding practice than most people realize). Presumably intended as a service to models, they have provided an excellent list of classes and venues, organized by state or province. I checked on the several classes and workshops in Delaware and Philadelphia that I have attended or am familiar with, including The Delaware College of Art and Design (where I teach an unrelated class), The Delaware Art Museum, The Samuel S. Fleisher Art Memorial, The Pennsylvania Academy of the Fine Arts, the Philadelphia Sketch Club and the Plastic Club. The listings for all of them seem accurate and reasonably up to date, so I might assume that their listing for other venues in North America are similarly good. Though I doubt it’s comprehensive, this is a great place to start if you are looking for a life drawing session. Some are formal classes, but many are individual sessions or open studios that you can attend when you like, without signing up for a specific number of classes. Some of the latter are instructed, many are open studios where you are on your own to work as you like without instruction. In most cases you bring your own materials, and the venue provides easels, chairs and sometimes even drawing benches. There is a moderator who administers the sessions and usually determines poses. Sessions can vary in length, but many are about three hours, with breaks for the models at intervals. If you haven’t attended life drawing sessions before, you’ll find most of the sessions quite beginner friendly, contact the school or organization and see what classes or sessions they recommend. As opposed to the more formal classes, most of the open studios and workshops are weekly, come and go as you please, and charge only a model fee for the session, usually about $8 – $10. Most of the listings offer a link to the venue sponsoring the sessions, where you can find more details and contact information (it’s always wise to make sure dates and times are current). 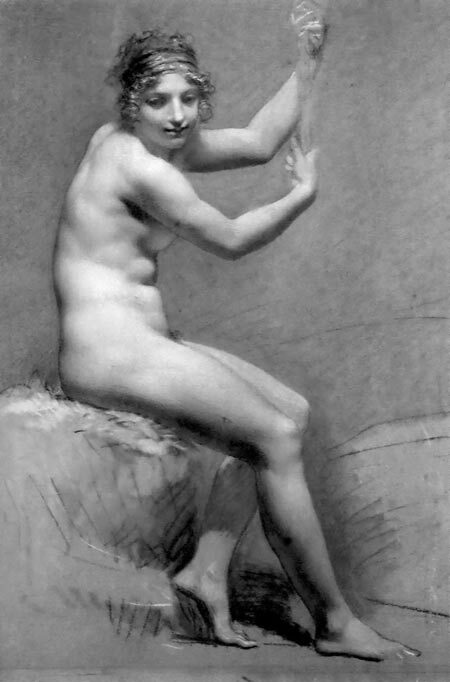 The image above is by Pierre-Paul Prud’hon, one of the finest academic figure artists, certainly one of my favorites, and is meant to be inspirational, not intimidating. One of the most important things I learned in my continuing practice of drawing from life was to never be intimidated by comparing my level of drawing ability to someone else’s ability. Nothing will hold you back more. We are all simply at different points on the path, and the more you draw, the further you go. I live in Seattle, and a member of our art community, John O’Brady, started a life drawing group on Meetup.com for all the life drawing sessions in the city a couple of years ago. He gave all the hosts of the various sessions administrator status, so they (not he) could up-date the information of their sessions. It has been working very well for us, and I would recommend checking out meetup.com for sessions in your area or starting one yourself. It’s encouraging to see in the above drawing that even a great master like Prud’hon didn’t get the face to go with the body. This is a fantastic resource, thank you for sharing! I live in a small town with no life model classes available and have struggled for a while to come up with a solution. Getting my friends to strip down and then perform the “down dog” position so I can draw some legs with good muscle definition is awkward. And a good way to get uninvited to their super-bowl party. Not that that happened. My solution was the Art Models book series by Maureen and Douglas Johnson. They come with a CD full of high-res photos of professional life-models. Each pose is photographed over 20 times to get a full 360 degree view of the model. It’s not quite the same as drawing from life- but I like having the convenience of it and the variety of angles I get. To those with sufficient interest, I heartily recommend “The Undressed Art: Why We Draw” written just a few years ago by Peter Steinhard. Three quarters of the book is about the resurgence of drawing the figure in recent decades. The book examines things like the subtle differences between practices on the east and west coasts (west coast models were able to unionize at one point, whereas east coast models — forgive the pun — never pulled it off), how the whole experience shapes up from the model’s side of the session, etc. The other quarter of the book examines the mechanics of how we learn drawing and what drawings represent to artists themselves and the larger world of art. I should also mention for the benefit of those who simply can’t get to a life drawing class, that there are some other resources for “virtual” figure drawing, particularly of interest tho those who must invent figures in particular poses for illustration or comics. See my post on Poser, Pose Maniacs and Virtual Pose. hey guys, for traditional paintings you can have a look a http://www.rtgallery.com they are lots of paintings there.